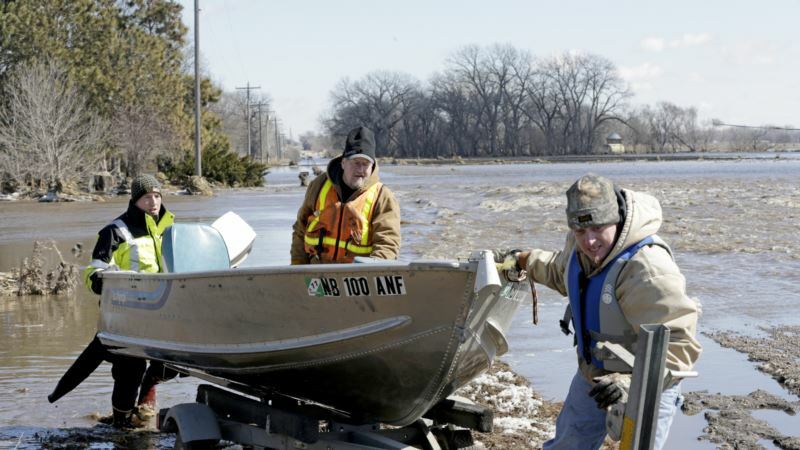 Authorities in the Midwestern United States ordered more evacuations Sunday after heavy rainfall and melting snow flooded several rivers and creeks, leading to the deaths of at least two people. The floods have inundated towns, breached dams and levees, and halted travel as a "bomb cyclone," a hurricane-like storm, battered the area. The governors of Nebraska, Iowa and Wisconsin have declared states of emergency, which will free up state money for people affected by the flooding. * Offutt Air Force Base, about 16 kilometers south of Omaha, was inundated by flooding from the Missouri River. Thirty buildings are flooded with more than 3 meters of water, Tech. Sgt. Rachelle Blake, a 55th Wing spokeswoman, told the Omaha World-Herald. * Hundreds of residents across the state were forced from their homes over the weekend. The American Red Cross has opened more than 20 shelters. State officials said several hundred people across the state have been rescued, and confirmed two people have died, and two men remain missing. * The National Weather Service said the Elkhorn River remained at major flood stage but was dropping. But the Missouri River continued to crest. It was expected to reach 12.5 meters in Plattsmouth on Sunday -- 1.22 meters higher than the record set in 2011. * The Cooper Nuclear Station, along the Missouri River in southeast Nebraska, may be forced to close down if the water continues to rise, the facility's officials said. * The towns of Waterloo and Fremont were surrounded by floodwaters, making it impossible for residents to get in or out of town. * Iowa Homeland Security and Emergency Management said nearly 2,000 people have been evacuated from eight areas in western Iowa since flooding began late last week. * The National Weather Service office in Davenport, Iowa, said flooding on the Mississippi could get worse in a few weeks as more snow melts in Minnesota and Wisconsin. * Forecasters expect floodwaters to crest in St. Joseph, in the northwest corner of the state, on Thursday, causing major flooding. Volunteers spent Sunday filling sandbags to help secure a levee protecting the city of 76,000. The Missouri River was forecast to climb to 8.2 meters -- 3 meters above flood stage. * The Mississippi River was also expected to cause moderate flooding in several eastern Missouri cities, including St. Louis. * Amtrak on Sunday said flooding was causing up to five-hour delays on passenger train service between Kansas City, Missouri, and St. Louis. Officials planned to cancel all service by Missouri River Runner trains on Monday. * The National Weather Service has issued flood warning for the cities of Alton, Grafton and Chester in southern Illinois, as the Mississippi River is expected to rise. * The Pecatonica and Rock rivers flooded several homes in the cities of Freeport, Rockford and Machesney Park in northern Illinois. The National Weather Service said record crests are possible along both rivers. * Minnesota officials said they are worried by Ice jams that have formed across several rivers and creeks in the state. * The Root and Cottonwood rivers were running high. In southwestern Minnesota, the Cottonwood River stood at 4.8 meters early Sunday, just shy of the mark considered a major flood stage near New Ulm. The Minnesota Department of Transportation said some state highways remained closed due to high water, while others had standing water but remained open to traffic. * Weather forecasters said cooler temperatures over the weekend had slowed snow melts, allowing water levels to drop. But they warned the respite was only temporary, with a significant risk of spring flooding in the coming weeks. * Officials said residents of Green Bay, who were evacuated late last week, are being allowed to return as floodwaters recede. The Green Bay Press Gazette said city inspectors were going through the city placing signs on the front doors of homes, identifying those not currently inhabitable because and those that are safe to re-enter. *Major flooding continued in the cities of Lodi and Darlington. Lodi Mayor Jim Ness said the flooding was the worst he has seen in his 71 years in the city, the Wisconsin State Journal reported. * "The warm temperatures and rain the last few days have caused much of the heavy snowpack and ice to melt resulting in flooding, ice jams, and rivers and creeks to rise," Governor Tony Evers said in a statement. * Governor Kristi Noem and other officials have been touring cities to see the extent of the damage caused by flooding across the state. "The storms this week have been extremely difficult for many of our communities," Noem said in a statement. "This has been a statewide emergency with people impacted by heavy snow, high winds, rain and freezing rain." Noem said the state is anticipating bad weather to last through this week. * In Sioux Falls, Mayor Paul TenHaken said cleanup is expected to be slow as city officials survey the damage before reopening roads and bridges. He said he expects the city bike trail, what he called the "jewel" of Sioux Falls, to be "closed for a while."